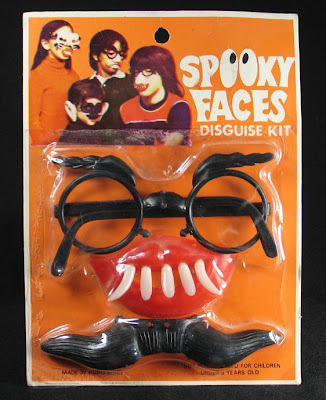 Naturally, the concept of a disguise kit held tremendous appeal when I was a kid. The right disguise can grant you access and privileges, and can even save your life in certain situations. Trouble was that no disguise kit I could afford was really serious about the matter. For example, the set seen above is a pure mockery. For starters there's the mustache. Might I remind you that children are not capable of growing facial hair. A real disguise is supposed to be undetectable as opposed to one that garners laughter. The glasses would have been fine had the eyebrows not been sculpted into the frames. And I shan't dignify those teeth with even a comment. 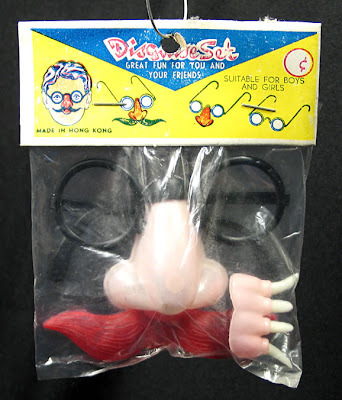 A knock off of a rip-off of the Groucho glasses. One still wonders how the red mustache came into play. 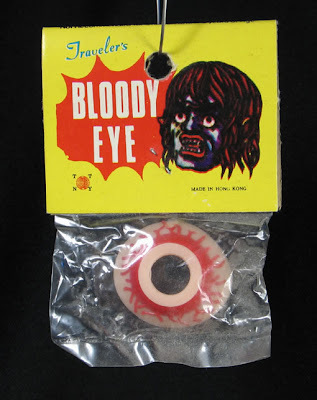 Traveler's Bloody Eye is pretty great. Though the header card seems to suggest an unexpected effect— the wearer turns into a fanged, long-haired ghoul that boasts bleach-white eyeballs. Moving on to teeth, this first specimen features my favorite product slogan in the history of commerce. It's a phrase that is totally quotable and can be worked into most any conversation with surprising ease—"Looks Life-Like in a Dopy Sort of Way." I laugh even as I type it. And hey, stop worrying— "Will Fit Right In Mouth." That's really all you need to know— wear these and you will look like a terrifying quaker, and your lips.. sensational. 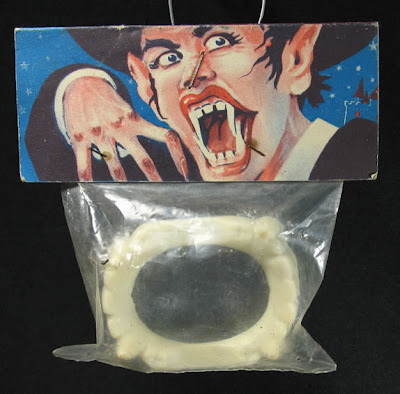 The sad truth is that over the years, plastic vampire fangs have evolved into a far less pointy state. Modern versions sport mere nubs compared to the flesh-piercing choppers of yesteryear. In fact, both this pair and the dopy ones are actually so sharp they punctured their plastic baggies. Want to work every member of the family into a fit of laughter? Try Gory Fangs. Or go with fangs that are completely free of gore and still call them gory, what's the difference? I liked this shot so much that I turned it into some desktop wallpaper, just in case you want to replace your tired old Sleepy Hollow background. If you put this image on your screen you will see that it looks practically life-like! Well, in a dopy sort of way. Click on the photo above for 1024 x 768 wallpaper. Cinema monitor size (1680 x 1050) is available here. Is it possible that the "Gory Fangs" are the oldest fang sets pictured? They are the first ones I recall seeing, and that was around 1971 or 1972. I thought they were the coolest things ever created. 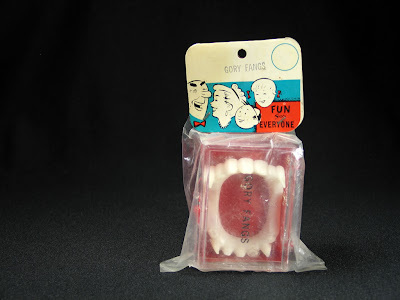 Great header cards, I like the plastic goofy teeth that illustrate their appropriateness for adult use and use the humble, honest claim: "Looks life-like in a dopey sort of way." If only other products were like this: "Gets stains out for the most part." "Takes kind of like real fruit juice." Someday I hoping for a fake fangs countdown! LOVE 'em! 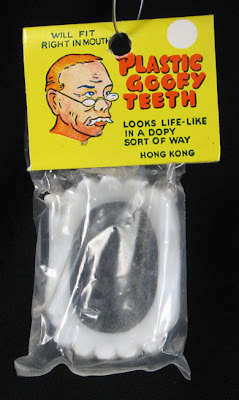 Oddly, that looks like my Great-Uncle Tommy on the Plastic Goofy Teeth package. At a swift glance, the teeth closely resemble his mustachio. 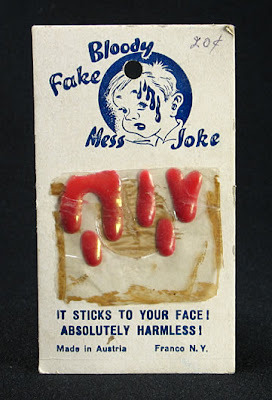 Hey Kirk - perhaps I've missed it on some archived post, but have you ever discussed the mystery behind just why companies think this crapola would sell? I mean... imagine sitting around the table during the new product ideation of some of this stuff... I just don't get it. Max- I have no way of knowing actually. Though I'm pretty sure that all these teeth are 1960s or earlier. The dopey ones have been manufactured for multiple decades. That header card was originally used for a different set of teeth that weren't fangs. They looked more like the ones in the illustration. rozum- ha. that would be great. In my mind the phrase is said with a shrug with a "what can ya do?" attitude. or else as though they realized mid sentence that they were being dishonest. Life like! Ok, ok, not entirely, more in a dopy sort of way. sparkle- ask you uncle if he posed for an artist in the orient sometime in the 50s. If so he needs to be getting royalties! iamchief- that's a great topic and no I've never really gone there. It's fascinating to me too. I have some theories on how things went but I should do some research. If I learn anything I'll definitely make a future post on the matter. 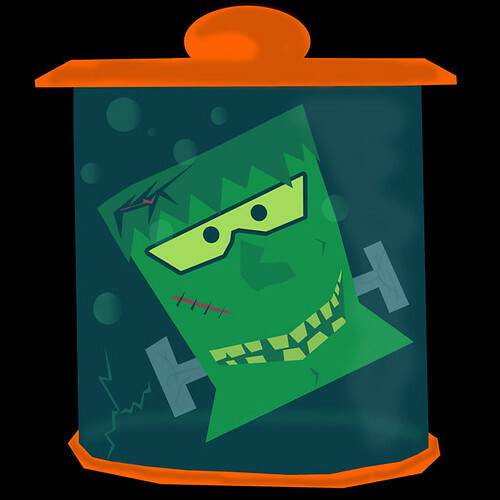 Basically I was scanning some junk for an upcoming Scar Stuff update & ran across some slightly less common (but cool!) 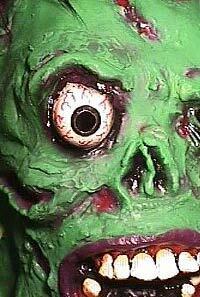 monster mag ads. Anyway they kinda fit the vibe of this post so here ya go.. Hope you (& everyone else) finds something new or fun to enjoy here! Ah, I couldn't resist -- there are 3 more pages now than when I first posted that link. Just too much cool stuff in those old mags.